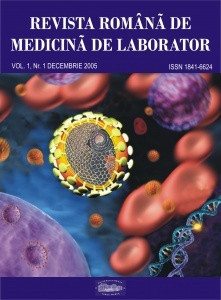 Revista Românã de Medicinã de Laborator (Romanian Journal of Laboratory Medicine - RJLabM) is the journal of Romanian Association of Laboratory Medicine, published for the first time in 2005 in Romanian and beginning with 2008 entirely in English. The publication is in electronic and printed format. The frequency is currently four issues per year. RJLabM is a peer-reviewed journal publishing editorials, original scientific and professional articles, general reviews, case reports, guidelines and recommendations of national and international scientific and professional associations, book reviews and announces events (congresses, symposia, courses) in the field of Laboratory Medicine. The Editorial Board and Scientific Reviewers are outstanding scientists ensuring high quality information within the journal. The peer-review system provided by experts is fair and constructive. Rejection Rate: 50-60% Average time to final decision: 90 days Plagiarism Screening System: The editorial board is participating in a growing community of CrossCheck System's users in order to ensure that the content published is original and trustworthy.